In I Corinthians 12:12-31, the apostle Paul uses the illustration of a physical body to describe gifting within the body of Christ. Though a body is made of different parts, they still work together as one body. Your short-term team is the same way. There will be different personalities, experiences and skill sets operating in various capacities. The hope is that all of these moving parts will come together to glorify Christ. It is our hope that each team member finds an opportunity to experience Christ in a meaningful way. A body is healthy when each organ and tissue works together to do its assigned job. A healthy team is characterized by each team member’s ability to use their strengths and work together. Most of us have experienced the frustration of trying to operate in an environment of ambiguous roles. With that in mind, as you prepare to serve on your short-term team, review the various roles of your team and ways in which you’ll interact with them. These roles include Food for the Hungry (FH), your team and your team’s audience. During the early years, the primary focus of FH was on short-term responses to disasters and emergencies, providing immediate and practical assistance such as food, clothing, medical care and temporary shelter. 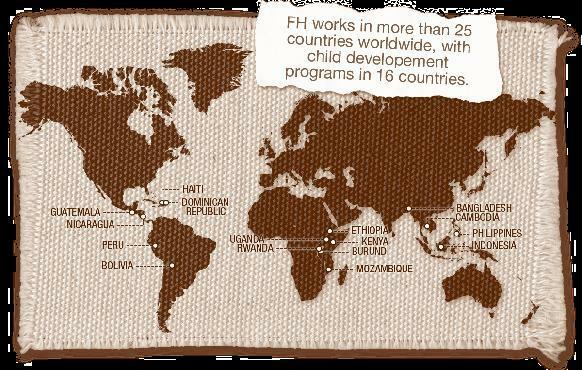 As time went on, FH developed initiatives geared more toward long-term development. By the early 1980s, FH had begun to work in communities with a strategic focus on developmental issues such as education, agricultural training and equipping church and community leaders. By the early 1990s, nearly 70 percent of FH operations were development-related and 30 percent were relief-related. That ratio remains about the same today. With the Micah 6:8 mandate (…to do justice, love mercy and walk humbly …) serving as inspiration, FH carries out our mission by “walking with churches, leaders and families to overcome all forms of human poverty by living in healthy relationship with God and His creation.” Our work will continue until physical and spiritual hungers end worldwide. Later in this manual, you’ll learn more about some of the programs that FH implements in the countries where we serve (commonly referred to as “the field”). You’ll also learn about the methodology and philosophy of how we go about carrying out these programs. While we will be discussing those things more fully later, we do want to introduce the key FH people that will be working with your team. The primary person with whom your team will be interacting with on the field is the Team Coordinator. This person lives in the country where your team will serve and will be your host during your time in-country. Our desire is to help ensure that your short-term team’s activities happen in the context of FH’s long-term strategy within the community you will serve. Your Team Coordinator knows and understands both the culture of the community in which you will serve and the role that your team plays in the long-term work FH is doing. Therefore, it’s important to listen and follow the advice and directions of your Team Coordinator. The FH Country Director will influence your team activities. The Country Director gives direction to all programs and initiatives in a particular country. You may or may not have an opportunity to meet the Country Director during your trip, but the Country Director will work with the Team Coordinator and other FH staff to help maximize the impact your team will have in the community and country that you’re serving. The real heroes in crafting your ministry experience are the community-level staff members. Serving in the community year-round, these are the individuals who communicate with appropriate leaders about how your team can serve and build relationships in the community. Given their perspective and intimate knowledge of the community, their input is invaluable in shaping the objectives of your team. We encourage you to think of your team as not just the individuals traveling with you, but those supporting you with prayer or finances. You can think of these two groups as your home team and your traveling team. As you consider your home team, it’s good to reflect on Paul’s letter to the church at Philippi. In the first chapter of that letter, he called them “partners in the gospel” (Philippians 1:5). In the letter, it becomes apparent that Paul considered them partners from their actions of prayer for him and financial support. It can be very easy to simply view your home team as sources of funds; however, we encourage you to see your supporters as mission control of a shuttle launch. While they are not going on the trip, their prayer, encouragement and resources are essential. Like Paul, we encourage you to value the prayer and financial involvement of your supporters and look for ways to involve them in your trip. As you prepare to leave the country, recognize that God is calling you to serve as part of a team. Your traveling team may include people you know well or others whom you have never met. Regardless of the situation, it is important to realize that God has placed each person on your team for a reason. Though each team member will have varying levels of relational, emotional and/or spiritual maturity, God has brought each of them on this journey just like He has brought you. God may want to teach them the same things He plans to teach you. Or, He may teach them something entirely different. God may even use them to teach you something. Regardless of why God may have brought someone on the team, you should recognize the truth of John 13:34-35, and offer your team members the respect, honor and love that God would desire we demonstrate to one another. Your Team Leader serves as a key part of your traveling team. During your trip, you may experience times of frustration, but remember it’s crucial that you submit to your Team Leader and Team Coordinator. If you have issues with how they are providing leadership for your team, do not vent your frustrations to your fellow team members. Following the principles found in Matthew 18, go to your Team Leader in private and talk to him or her about your concerns in a Christ-honoring fashion. The final member of your traveling team is probably one you feel you know pretty well. The final team member is you. Even though you may feel that you know yourself well, be open to discover new things about yourself on this trip. Every team has its own dynamics. You may find that the dynamics of your particular team tend to bring out certain parts of your personality or character that you don’t always see on a daily basis. These can be good characteristics or ones that make you cringe. Just remember to allow the Holy Spirit to work in your life in new and exciting ways. A helpful tool to process your thoughts is through journaling. Your team will have a big audience. Some of them may be silent—but don’t assume they’re not watching. The first, and perhaps most obvious audience members, are the members of the community in which your team will serve. Community members will notice how you interact with them and your fellow team members. If they hear you talking about the love of Christ, but see you being disrespectful to a fellow team member—your words will carry no weight. Keep in mind that people observe you during official team activity times and when you are on off-time. From your first invitation to participate in this trip until long after you leave the field—your actions have impact on non-believers. Whatever you’re doing, you can either reflect the love of Christ or cause people to turn away from God. We encourage you to take an active role in getting to know the community members. Ask questions about their lives, their family and their community. Demonstrate that you care by being intentional in getting to know them. Other audience members may include FH partners your team is working with, such as churches. As mentioned earlier, FH “walks with churches, leaders, and families in overcoming all forms of human poverty.” In other words, we value partnerships. We work with community leaders and other organizations in the field. We see these types of partnerships as opportunities to demonstrate the love of Christ. In the field, do not assume that all individuals assisting your team are Christians. However, consider this a great opportunity to share the love of Christ to individuals who don’t have a personal relationship with Him. One of the best ways to be intentional in connecting with those you meet is to learn about their culture. In the next chapter we’ll discuss how you can learn about the culture of the people you will meet in the field. In addition to the people you meet on the field, there are other audience members you will come in contact with long before you step foot on the airplane. From the moment you join the team, every person you talk to about your trip is an audience member—take advantage of the opportunity to shine the light of Christ. There are Christians who do not understand wholistic ministry. You will have the opportunity to demonstrate and explain God’s intent for the whole person (a topic we’ll discuss more in later chapters). You will meet non-Christians who admire the humanitarian aspects of your trip, but do not understand the true motivation behind your involvement. Use this opportunity to let them know that it is the love of Christ that motivates and compels you to reach out to those in need. Finally, in Hebrews 11, we are reminded that our greatest audience of all is in heaven. When our actions are motivated by our love for God, we can trust that He is faithful to sustain us, refresh us and supply our needs. As part of a short-term team, we have an incredible opportunity to offer our time and efforts as an act of worship to God. While a sincere desire to go is already pleasing to God, let us make sure that we go to serve and interact with all those involved in our trip in a way that is honoring to the Father. Remember, God is the ultimate “who” in your story and the story of the community where you will serve. This trip is not about you coming in to save the community from their poverty. God is working in the community now and will continue to do so after you leave. Pray for your new friends and trust them into God’s care. 1. What are the ways through which you can go deeper with or minister to members of your home team? 2. The following Scriptures provide guidance on ways we should interact with team members. James 1:19-20 (“…Everyone should be quick to listen, slow to speak and slow to become angry…”). What could hinder you from interacting with your team members in this way? What are the practical things you can do to address those difficulties? 3. Think about some of the audience members, other than your home team, who you will be in contact with prior to your trip. How can you use this trip as an opportunity to positively engage them? 4. Read and think about the quotes from FH field staff on becoming a team. 5. Read the Team Challenge. Will you and your team take the challenge? 1. Watch and discuss the Juxta videos. 2. A useful tool for processing your team experience is journaling. There is no right or wrong way to journal. Some people write a letter to God and others write to themselves. Regardless of the actual format, the purpose is to be open and honest with your thoughts and feelings. View the Psalms as your example. The writers of this book recognized that the world we live in is not free from hardships and suffering. We, too, should not shy away from processing harsh realities or hard truths. For your first entry, write honestly to God about your reasons and expectations for being a part of this short-term team. Why was this event important? What did it mean to me? What has God shown me so far through this event? 3. Read Food for the Hungry’s Values in Appendix A. How can they apply to you as you serve on this short-term team? 4. Read Megan’s Story. What can you learn from it?